It is tradition in American culture to bestow paper upon one’s beloved in recognition of the first wedding anniversary. While The Astronomer and I usually buck tradition, there was something awesomely antiquated and strangely appealing about this age-old gift giving ritual. A special book, a letter written by hand, or a magazine subscription would have all made very nice gifts for The Astronomer; however, none of these things resonated with me personally. I wanted to give him something truly unique to honor the occasion. After plotting and planning for a few weeks, I came up with a quirky idea. Rather than define “paper” literally, I decided to interpret it edibly. For our first wedding anniversary, I presented The Astronomer with rice paper in the form of gỏi cuốn and bò bía. My husband’s the kind of guy who really appreciates cleverness, ingenuity, and deliciousness, so this gift was absolutely perfect for him. 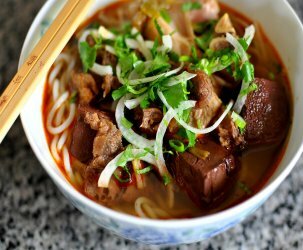 Gỏi cuốn is a popular snack food in Vietnam and is usually ordered as an appetizer in Vietnamese restaurants stateside. 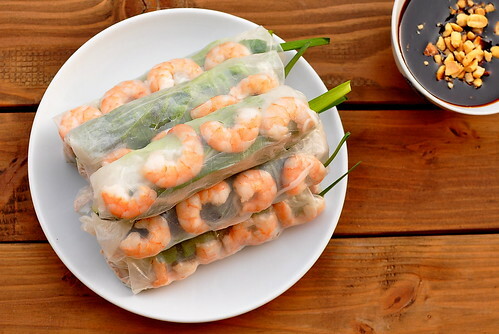 It is comprised of tightly wrapped rice paper bundles filled with pork, shrimp, vermicelli noodles, herbs, and greens. 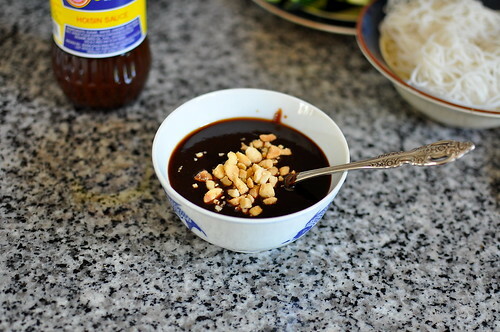 A Hoisin-based sauce topped with crushed peanuts is often served on the side for dipping. The flavors and textures present in this dish are fresh, snappy, and satisfying, kind of like our first year of marriage. Bring a small saucepan filled with salted water to a boil over high heat. Add the shrimp and cook for 30 to 60 seconds or until just cooked through. Remove the shrimp with a slotted spoon and set aside to cool. While the water is still boiling, add the pork. Reduce the heat and poach the pork at a low simmer for 15 to 18 minutes or until cooked through. Remove the pork and set aside to cool. Reserve the stock for the Hoisin dipping sauce. Once the shrimp have cooled, slice each one in half horizontally. Once the pork has cooled, cut across the grain to create thin slices of pork. 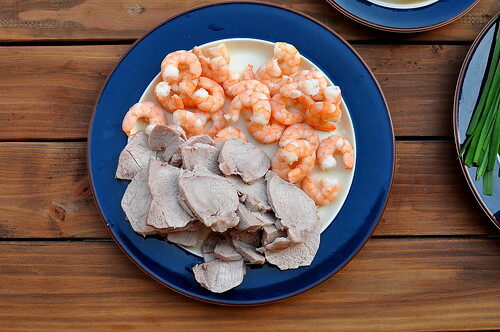 Set the shrimp and pork aside. Wash head of lettuce thoroughly and remove the ribs. Remove the seeds from the cucumber and slice thinly. Wash and trim the mint and garlic chives as necessary. Quickly wet a piece of rice paper under running water, making sure to moisten both sides. Lay it down on a cutting board. 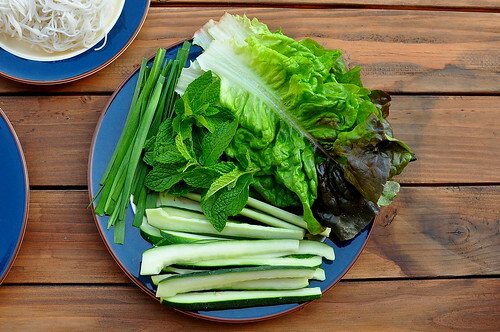 Place a lettuce leaf at the lower end of the rice paper. Add rice noodles, pork, mint, and cucumber evenly across the rice paper. 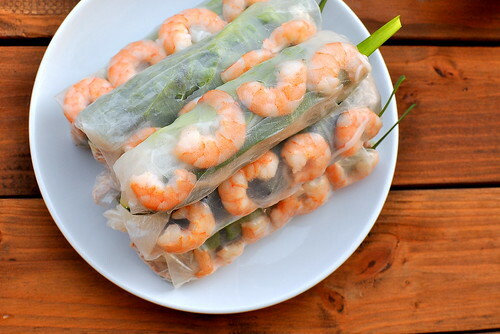 Roll the rice paper over the filling and tuck it underneath. Add the shrimp with the sliced side facing up. Fold the sides inward and add a chive over the shrimp. 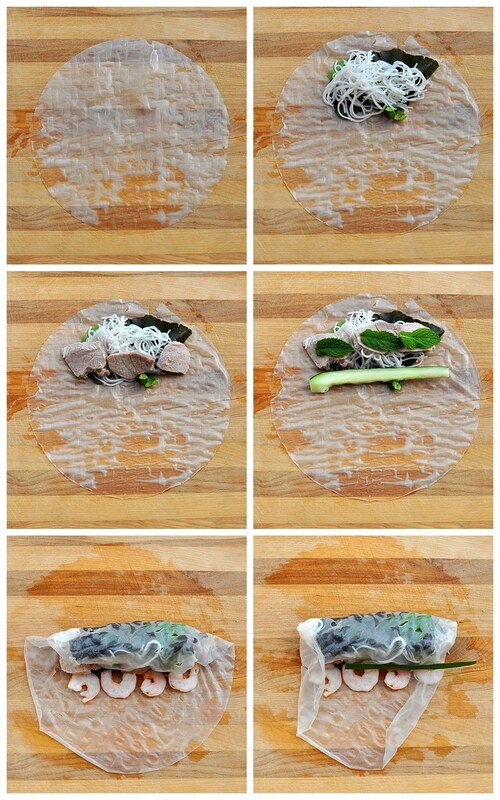 Continue rolling as tight as possible without tearing the rice paper. Repeat until there are no more shrimp and pork. In a small saucepan, whisk together 1 cup of Hoisin sauce with 1/8 to 1/4 cup of the pork and shrimp broth and 1/2 teaspoon sugar. Use less liquid for a thicker sauce and more for a looser one. Heat over a low flame until the sugar has dissolved, approximately 1 to 2 minutes. Remove the sauce from the heat, top with peanuts, and serve with the gỏi cuốn. Makes 16 to 18 gỏi cuốn. Hahaha I love it! You are a smart one, Gastronomer. And what did the Astronomer give you? Parchment paper? Lucky guy! Those rolls looks so professional. I can never get mines to look that good…but they taste good enough for me. This looks beautiful and delicious! Happy anniversary, Gastronomer & Astronomer! 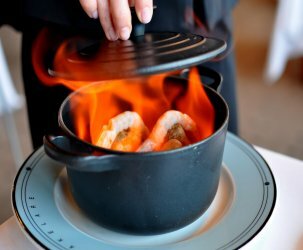 we always heated up peanut butter when preparing the hoison sauce so that it doesn’t taste as salty. Perhaps you can put the Hoisin sauce inside the roll to give the flavors a better blend but it’s also good to put it out so each person can add the desired amount. Sarah – PB is a fantastic addition for increasing the sauce’s depth of flavor. The Astronomer’s a little PB averse, so I went with straight up Hoisin. 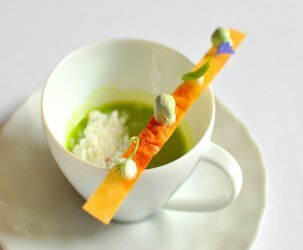 It’s definitely not too salty with a bit of sugar and the broth. I also like adding some chili garlic sauce into the mix if I’m feeling a little spicy! David – That’s a good idea, especially if the goi cuon are being served at a cocktail party. I really needed a step-by-step guide on how to do this since mine always seem to tear. I didn’t realize I needed to remove the rib of the lettuce (DUH!) which probably helps a lot. My question is this: Can you stack them (like you do in the photo) without them sticking together? Mine always attach themselves to each other and tear again. Please help! Thanks. Anne – Good question! The rolls shouldn’t tear as long as they stay moist. I suggest draping a wet paper towel over them to help retain moisture. I LOVE these! So thankful for a recipe so I can try them out – thanks! Happy anniversary you two! This dish is a staple in my family. Light and healthy for summer season. Sara – we add peanut butter into our sauce too. I have to say I like the way you rolled the springrolls so the shrimp is the star. awww you make it all sound so easy… those look so gorgeous. congratulations you two! I can’t wait to try these this week! Thank you for sharing. I’m happy to report that these were delicious and very flavorful. The rolling is a bit more challenging than I thought, but that’s probably because I was greedy and stuffed too much goodness into each one. Thank you again for sharing. Thanks for reporting back, Patricia! I’m glad to hear the rolls turned out well 🙂 The wrapping takes some practice; I’m sure you’ll master it next time! yum. love eating goi cuon! I just moved to the middle of nowhere in Oregon from sunny Cali. Didn’t think I would miss Vietnamese food so much. Thank you for thr share and we’ll be making these soon. I love the idea of goi cuon for your paper anniversary! Very clever. My wife and I are wayyyy past our 1st year 😉 I still made a vegan version of your goi cuon last week for a picnic. Those goi cuon chay were great. I just posted the recipe on our blog. Hope you still like Oregon. Beautiful state!